Price: Ex. Pune: Rs.22900/- Ex. Mumbai: Rs.21900/- Ex. 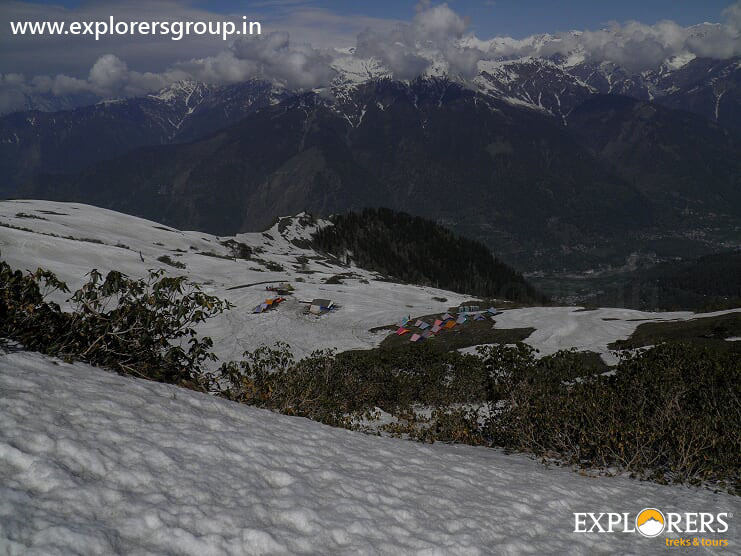 Delhi: Rs.18900/-Please Call for availability before you book any Event/Trek, to avoid 5% Transaction Charges. 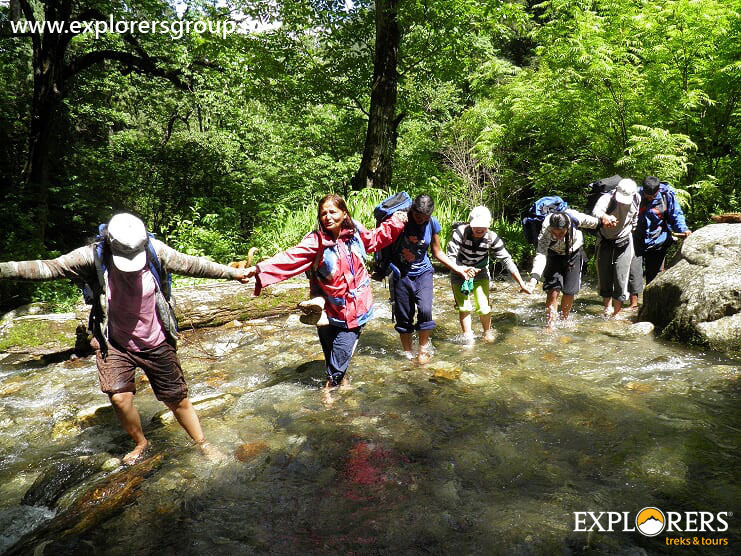 Want to enjoy the pristine Himalayan wilderness and have a memorable trekking experience, which takes you in a different tangent altogether, Welcome to SHIRGAN–TUNGU (PRE-MONSOON) BASE TREK (A GROUP OF GIGANTIC FOLDED MOUNTAIN VALLEYS). We promise you the best of experience…the likes of which you will never have encountered before. 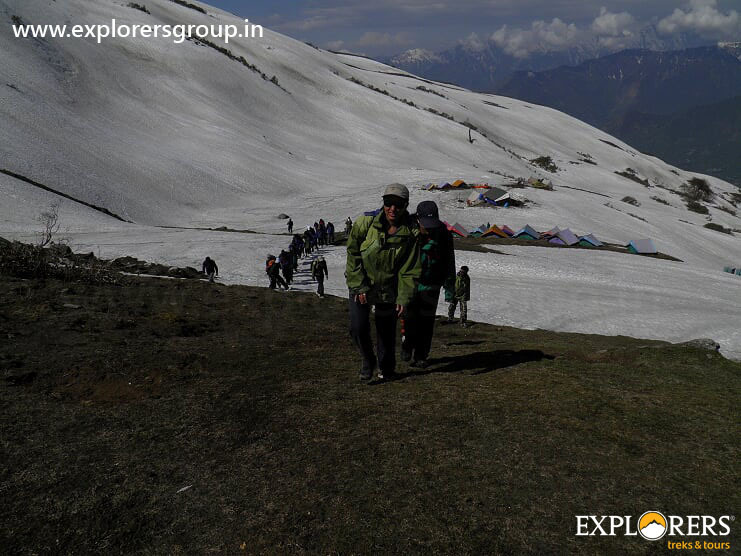 This exotic and immensely rewarding trek encompasses the mountainous vistas of the divinely beautiful Kullu & Manali valley and beyond Pirpanjal valleys and traverses the high altitude passes of ‘Chhoye Pande’ means at the top solid heap of rocks of lateral moraine. 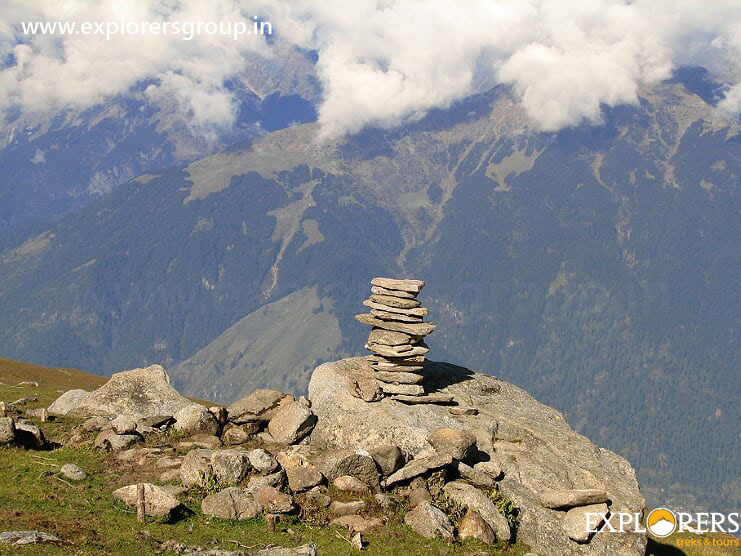 Couple of Saur (Lake) and over (4450 m) passes to Malana Village accompanies this mountaineering base of Shirgan-Tungu. 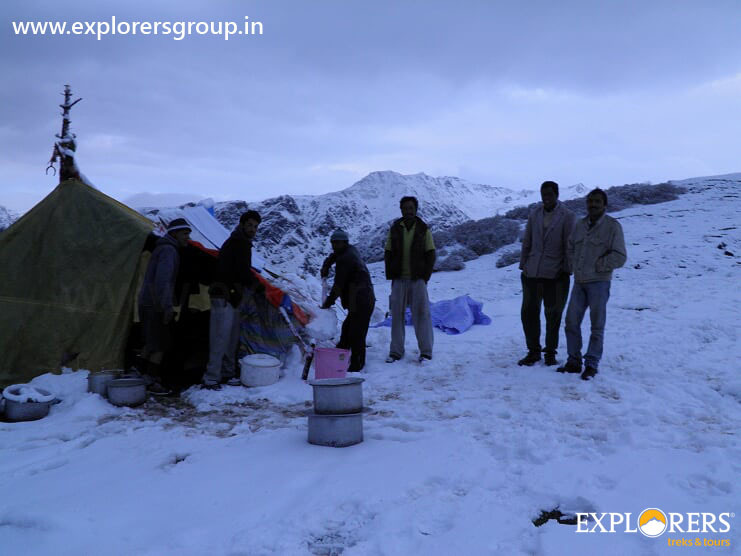 Daily Trek updates on “WhatsApp”by Team Explorers . Pune to Pune AC Transport. 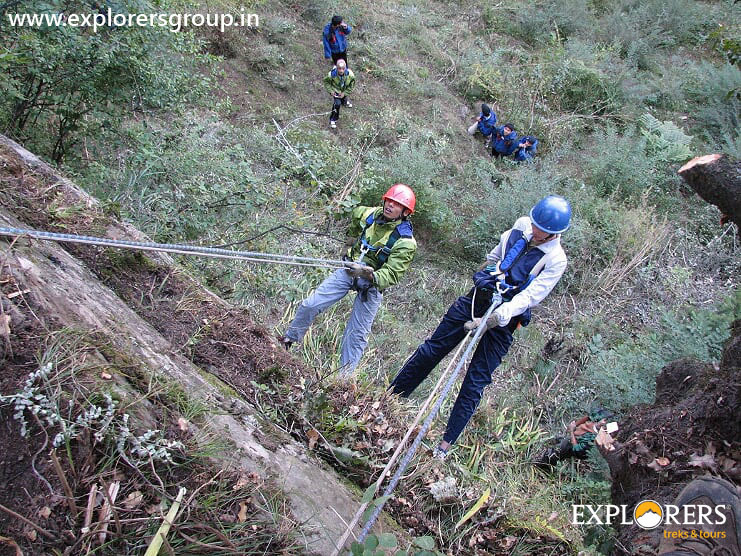 18 Years of Experience in the Industry with Dynamic, Experienced & Certified Team of Explorers. 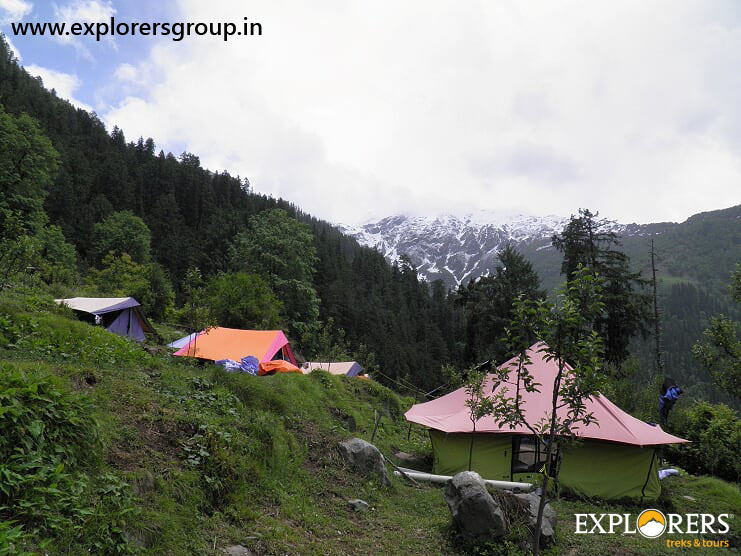 Beautiful Campsite surrounded by Silver fir forest & snow capped mountains in Manali. Please Call for availability before you book Shirghan-Tungu Trek, to avoid 5% Transaction Charges. Last date of Enrollment for Shirghan-Tungu: Limited Seats… Book your Seat in Advance i.e. before 122 days to avail Early Bird Discount. 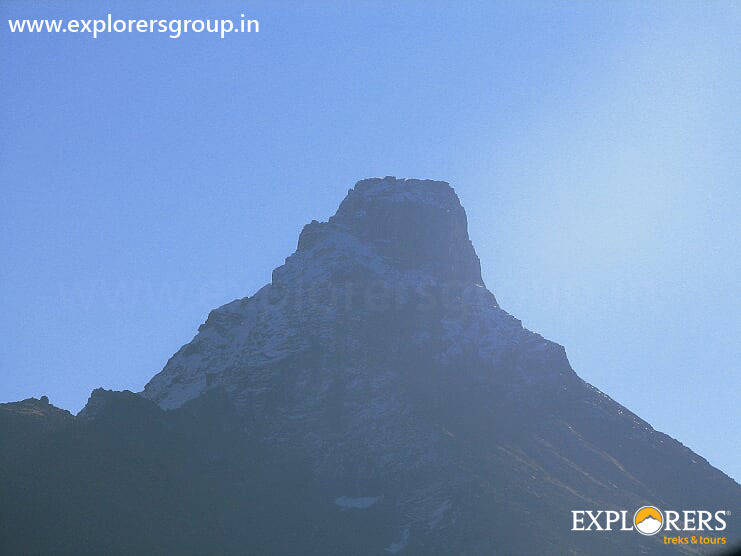 Departure Date & Time for Shirghan-Tungu: Day 1 by Sharp 07.00 am from Explorers Office, Pune. Arrival Date & Time of Shirghan-Tungu: Day 12 around 02.00 pm at Explorers office, Pune. Reporting Time and Place for Shirghan-Tungu: Day 1 by Sharp 06.30 am at Explorers Office. 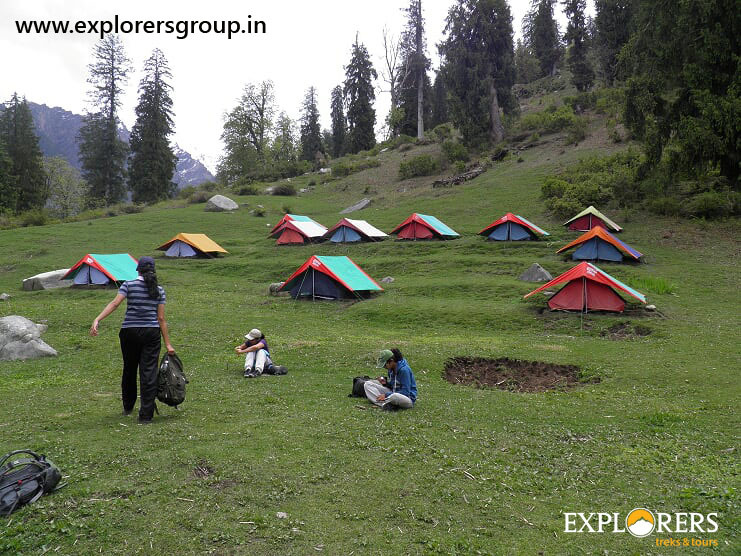 Type of Accommodation in Shirghan-Tungu: Accommodation in tents at Manali (Shuru) & at higher campsite on multiple sharing basis. Route for Shirghan-Tungu: Pune to Mumbai by AC Bus. Mumbai to Delhi by 3 AC Train & Delhi to Manali by Semi Sleeper Volvo. Batch Limit for Shirghan-Tungu: 40 Participants. Age Group for Shirghan-Tungu: Above 15 Years. 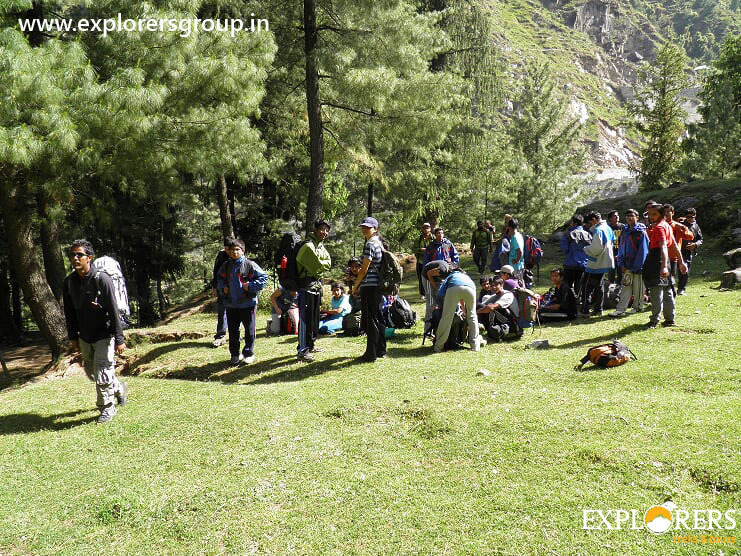 All Participants have to report at Explorers Office by Sharp 6.30 am. Depart for Bandra Terminus at 7 am. Breakfast on the way. Reach Bandra around 11 am (Mumbai Participants can Join at Bandra Station at their Own arrangements.) Board 12216 DEE Garibrath Express (3 AC) 12.45 pm & proceed towards Delhi. Reach Delhi Rohila Station at 12.15 pm. After Lunch depart for Manali by Semi Sleeper Volvo around 5 pm. Arrive at Manali Bus Stand around 9 am. Onward Journey for just 5 kms by Local Sumo. On arrival at base camp tents will be allotted. 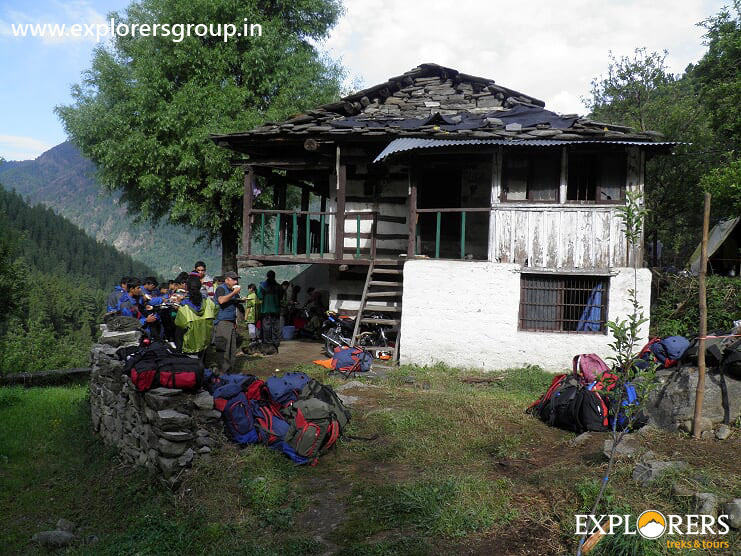 After Introduction session will move to Jamdagni Rishi Temple with backpack for acclimatisation Trek. 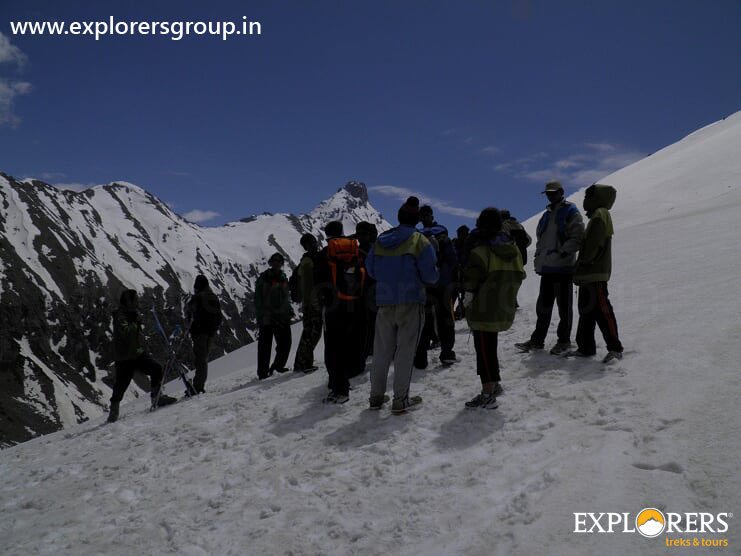 Acclimatization Trek to get your body used to the altitude & Climate. Today’s trek is very relaxing just to check up ones physical conditions and also better for acclimatization. After completion of muscularity exercises and return back to Lunch at base camp. 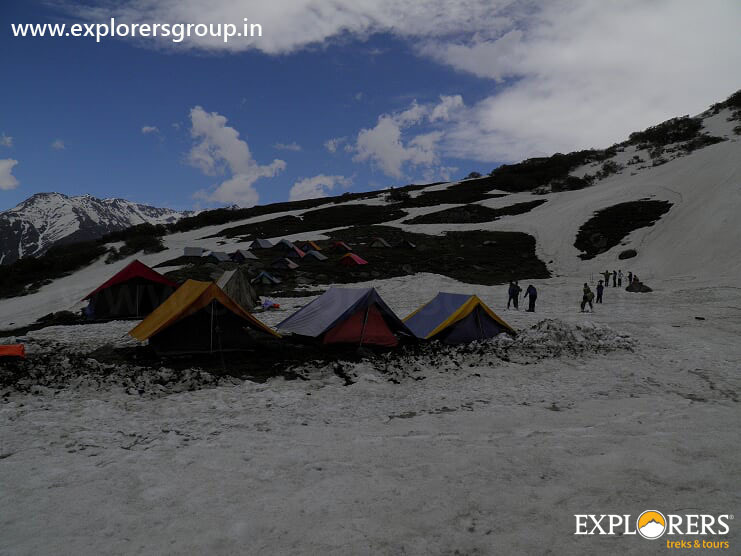 Stay overnight at Base Camp at Shuru. After Breakfast & warm up, Trek starts from Shuru, down to Jagatsukh village to Dhuhagan Bridge, and over the Dhuhagan River to the other side of the valley. 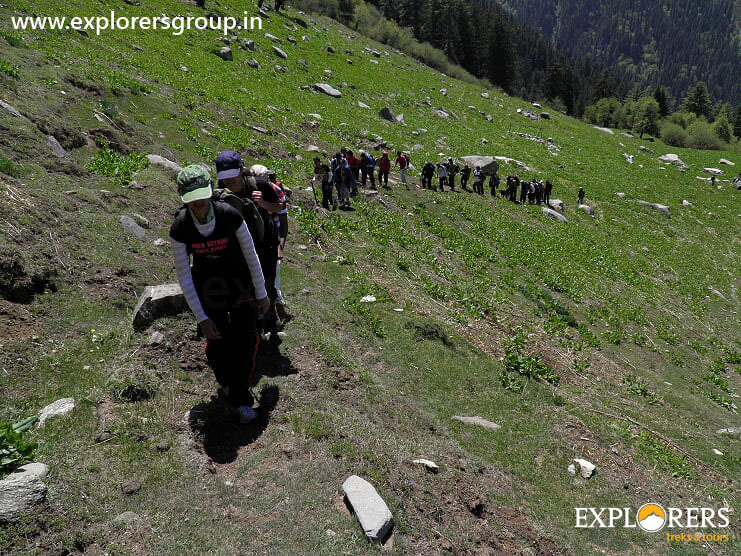 Trek starts with a gradual climb up & gradient increases gently and at some portions one has to climb in a zigzag way. The Negi Dugh is located high at a vantage point and is surrounded by Cedar trees. In the evening explore camp and move to evening activities. Overnight at the Negi Dugh. Today’s trek proceeds in a zigzag way through dense forest of pines and Silver fir. Once the zigzag trail ends, it is a steep ascent amidst silver fir trees. 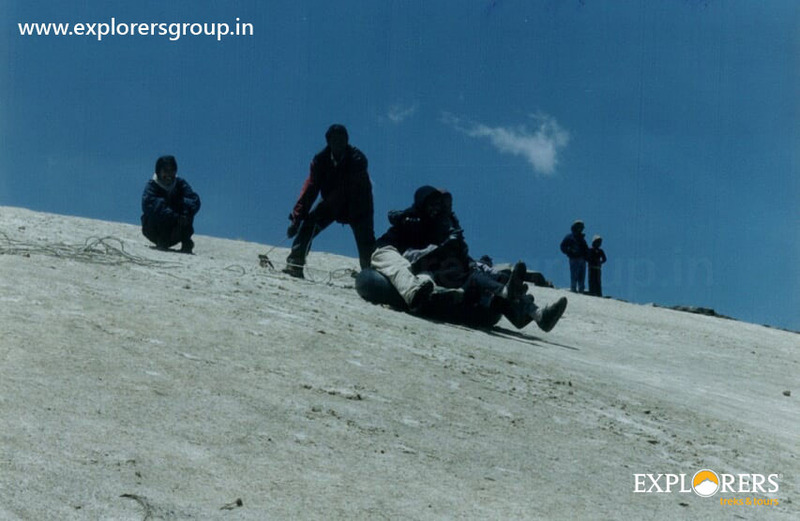 Some portions of the climb are to be tackled in a horizontal way till the steep ridge of Kurrdi. The tough climb starts again along the steep ridge for an hour after which it is a moderate walk along the slanted slope right up to the campsite Kurrdi. 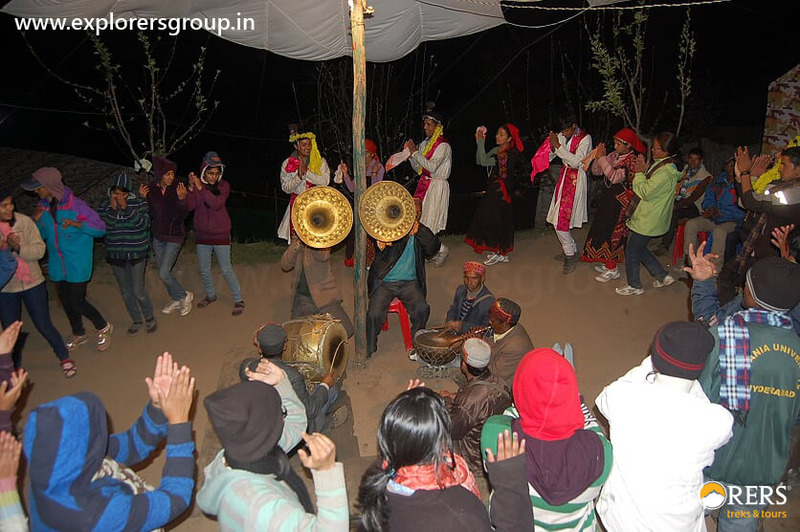 Kurrdi is a luminous point and one can have a vast view of Kullu, Chanderkhani Pass and Manali valley. In the evening explore camp and move to evening activities. 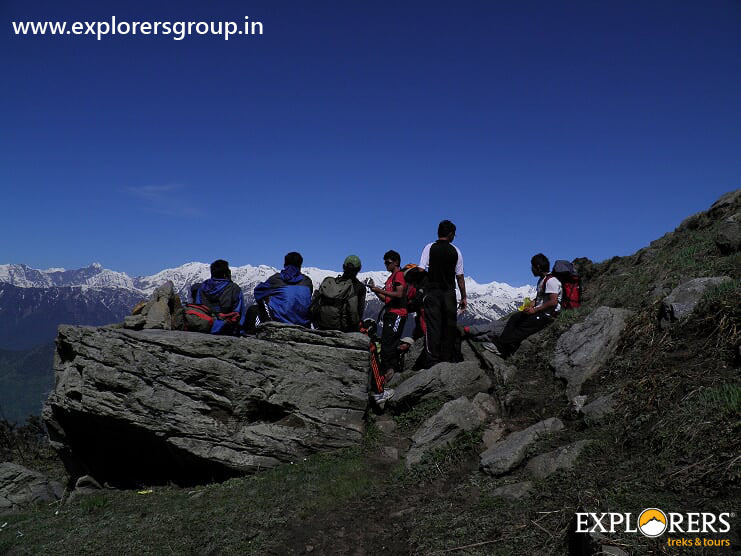 The trek starts with a steep section at the start, through forest of silver fir, Bhujpattar, oak and chestnut. At the end of the steep section trekkers have to negotiate moderate climbs through forestry side ridge up to Moar Thach and Samalach Thach. From Samalach Thach the route ascends on a moderate grassy slope and then onto a moderate horizontal traverses above the tree line to the campsite. 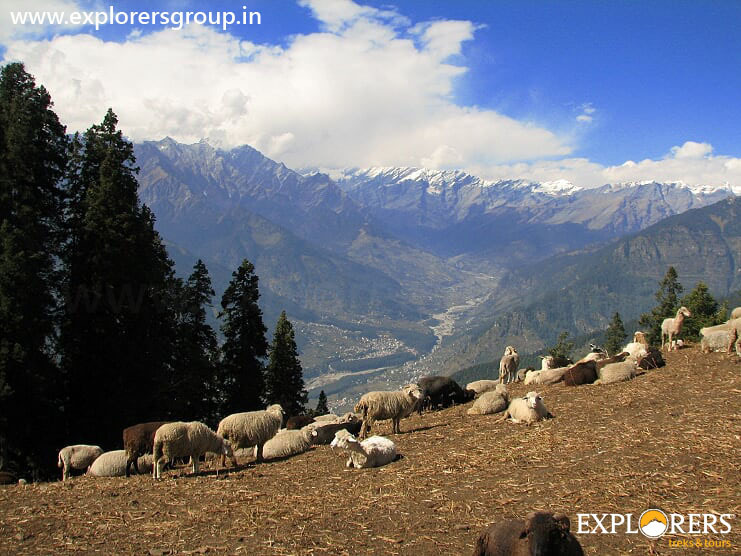 Dharanoo Dugh is located in a grassy meadow on the hill of the Shirgan -Tungu on one side of the Pirpanjal range. 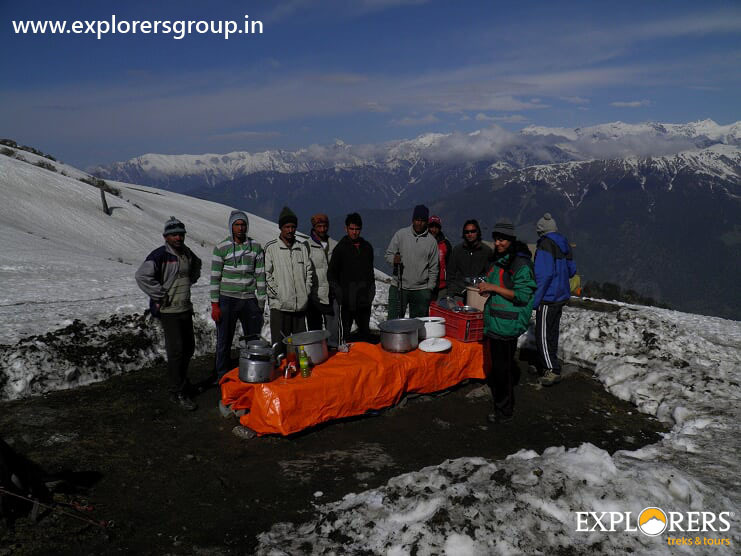 From the camp, there is an enchanting view of the Dhauladhar range, Chhota Bhangal, kalyani Pass and its lofty mountain peaks. 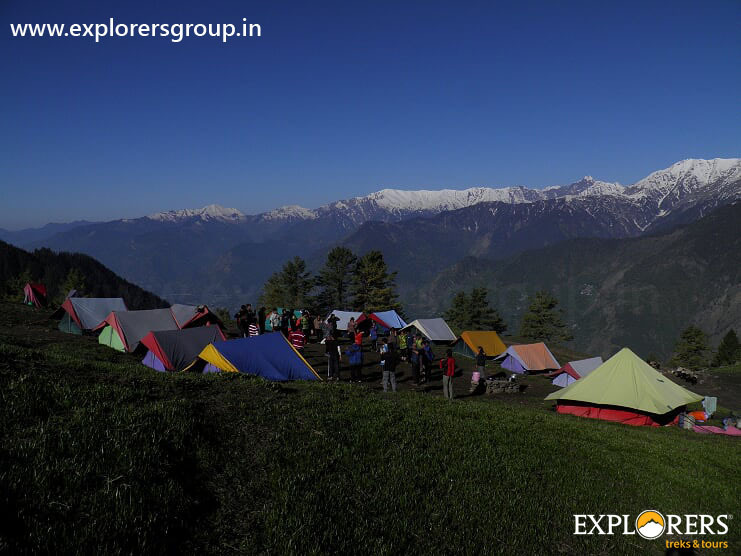 from campsite you can also have a full view of Manali valley, and the distant snowcapped mountains of Beas Kund, Rohtang Pass massif and Khanaul & Chhika. 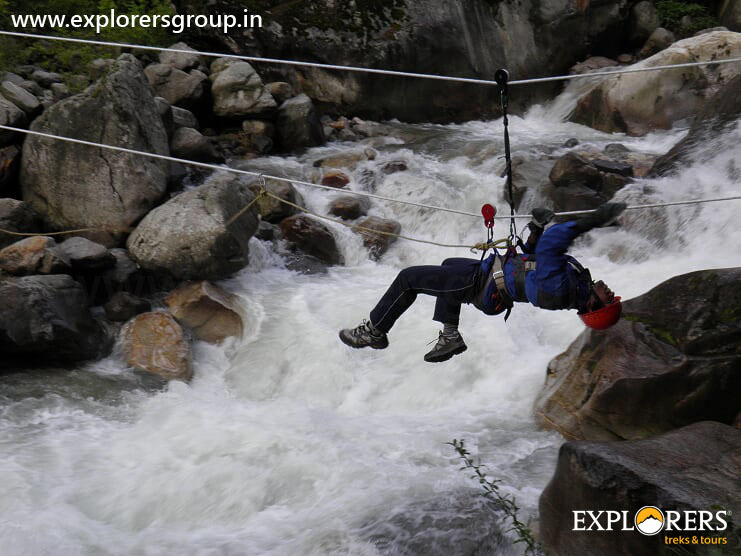 In the evening enjoy some fun adventure activities. 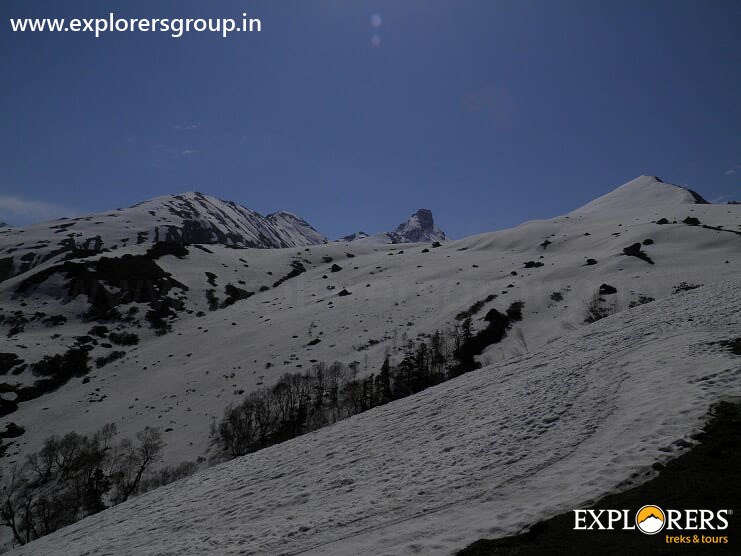 The trail proceeds on the long snowy slanted ridge and slowly begins to ascend towards Shirgan-Tungu Base. The first magnificent view of the Shirgan Tungu Peak comes in glance after gaining a 15 minutes’ walk on the snowy ridge and as you ascends and gets nearer to you. The climb along the ridge though enjoyable is windy with a chill wind blowing. 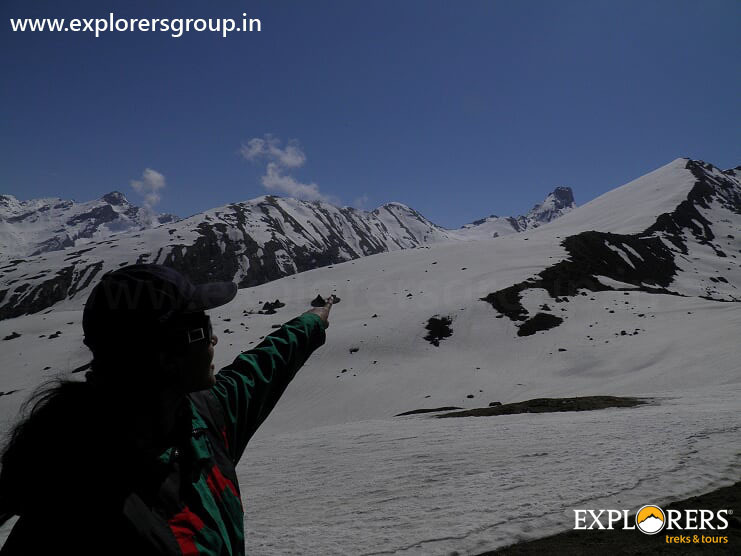 While descending down to campsite have breathtaking views of the surrounding mountain peaks of the Pirpanjal Range, Chanderkhani pass & Malana, Dhauladhar range, Chhota Bhangal, and further beyond the greater Himalayan ranges. Trail descends same way down in a zigzag way through Moar Thach (3235m), to Kurrdi and at little down Kurrdi is a diversion to Jammu Dugh and Banad. If time permits will take some adventure activities. Morning at Leisure. After breakfast freshen-up. Keep your bags ready. Post Lunch will move to Magical Mall road for shopping. Evening depart towards Delhi by Volvo. Arrival at Delhi around 7.30 am. Board Train 12215 Garibrath Express 3 AC for Bandra Terminus by 9.20 am. Arrival at Bandra Terminus at 8.10 am. Proceed to Pune by Private AC Coach. Reach Pune around 2 pm. Relax at home with everlasting Memories. Call us for Best Rates. Don’t forget to call us if you have a group of more than 10 for special discount. Get in touch with Team Explorers for seat availability & best Price all the time. Group Discount for Shirghan-Tungu: 6 Pax. OR more – Rs. 500 per Head for Train Departures Only. For a Group of 10 or more Don’t forget to call us for best AIR Price. Early Bird Discount for Shirghan-Tungu: 122 Days before the date of Departure – Rs. 1000 per Head for Train Departures Only. Private AC Bus: Pune – Bandra Terminus – Pune. 3 AC Train Journey: Bandra Terminus – Delhi – Bandra Terminus. Semi Sleeper AC Volvo: Delhi – Manali – Delhi. All food charges (Breakfast, Lunch & Dinner) Ex. Manali. 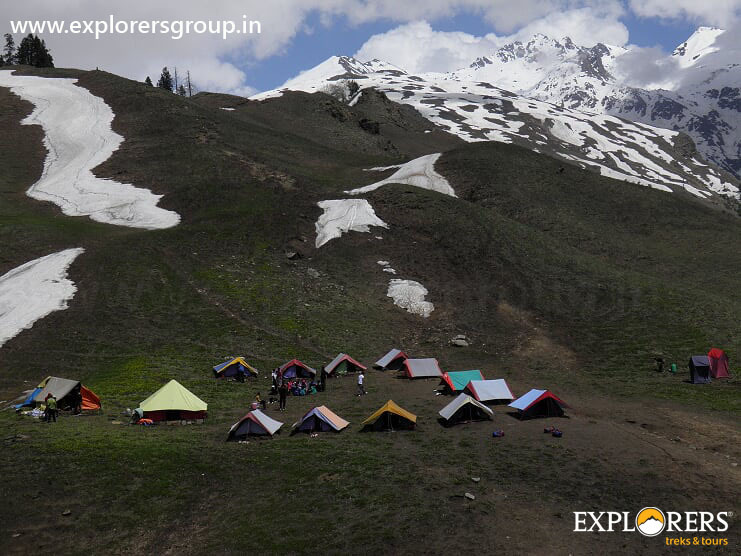 Accommodation in tents at Manali (Shuru) and at higher campsite on multiple sharing. Charges for the activities mentioned above. First Aid, Oxygen Cylinder, if required. What to Bring for Shirghan-Tungu Trek? Hair Oil, Cold Cream, Lip guard, Comb, Sun cream Lotion, Perfume / Deodorant. Flexible Dress for Trekking & Adventure Activities, Extra Dresses for Journey, Full Sleeves T-Shirt (Preferably Dry fit / Lycra) & T-Shirt given by Explorers, Thermal wear. Sports shoes, Extra Socks Pairs, Floaters for Journey. Mobile & Mobile Charger, Power Bank. Water bottle – Min. 2 Ltr., Torch with extra Cells, Id Proof Original (compulsory), Nail cutter, Safety pin, Chain & lock for luggage security in Rail Journey. Enough & Change Money for Shopping, (Tentative Rs.5000) Breakfast, Meals during journey Period. * This is just a reminder list of what to Bring for Shirghan-Tungu Trek. You can bring other things as per the Need. We will provide the following items to the Participants For Shirghan-Tungu Trek – (For CAMP Period only on returnable basis). Following things are given Complementary by Explorers in Shirghan-Tungu Trek. Familiarize yourself to new shoes before bringing them to the Shirghan-Tungu Trek. Shoes must be large enough so that you can wriggle your toes with socks on. For Shirghan-Tungu Trek be sure to bring along your pullovers, jerkins / wind cheaters, monkey caps, gloves, Thermal wear, etc. Keep our environment clean. Please carry all non-biodegradable (plastic) waste back with you. Do not keep valuable while trekking / Camping.